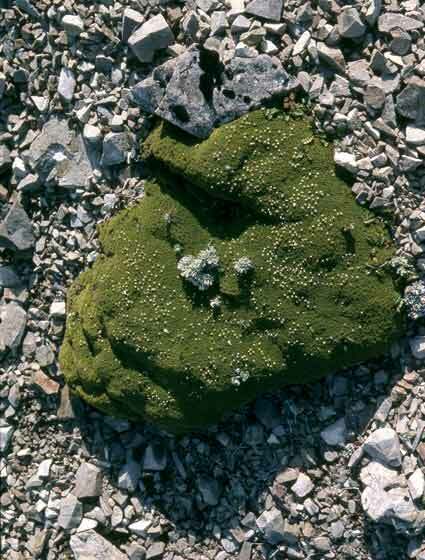 Cushion plants are distinctive in alpine and arctic zones, and are well represented in New Zealand’s mountains. With their shoots and tiny leaves compacted into mounds that hug the ground, cushion plants can withstand the exposed and abrasive environment of open, rocky ground at high altitude. Their smooth, rounded surfaces deflect winds, and the tight growth prevents cold winds from reaching the plant's interior. This flowering cushion of Phyllachne colensoi, with a greyish-white daisy (Raoulia grandiflora) growing from its centre, is on the Armstrong Saddle in the Ruahine Range.